A4 Size 7.3 x 9.25 in. (186 x 235 mm) 8.3 x 11.7 in. A4 Mounted 7.3 x 9.25 in. (186 x 235 mm) 11 x 14 in. (272 x 344 mm) 11.7 x 16.5 in. SMALL 10 x 12.7 in. (254 x 322 mm) 12 x 16 in. 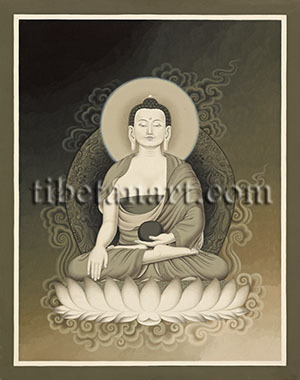 This small sepia painting depicts Shakyamuni Buddha amidst a gradated background of soft clouds, as he sits in vajra-posture upon the seed-head of an open lotus. Shakyamuni, the 'Sage of the Shakya tribe' and the historical Buddha of our present era, wears the three dull red robes of a simple Buddhist monk, although the expression captured upon his face conveys the qualities of spiritual sovereignty and a profound state of meditative absorption. His radiant body is endowed with the thirty-two major marks and eighty minor signs of an enlightened being, such as the urna between his eyebrows, the three conch-like creases under his chin, his tightly curled dark hair that spirals to the right, and the ushnisha or 'wisdom protuberance' that crowns his head. With his right hand resting gently in front of his knee Shakyamuni makes the 'earth-witness' or 'earth touching' bhumisparsa-mudra; while his left hand rests upon his lap in the gesture of meditation or dhyana-mudra, with his blue alms-bowl resting upon his open palm. His dark aura is decorated with clouds, lotuses, and the dancing forms of two offering goddesses.